Here it is. The big one. Google has redesigned every emoji in the latest Android release and added all the latest emojis. T-Rex, Orange Heart, Vomit Face and Breastfeeding are some of the new emojis now available. Android 8.0 "Oreo" has been in beta for several months with our first report in May outlining the design changes which have killed the blobs. Now in a final release, Android 8.0 "Oreo" includes full support for Emoji 5.0, which means 69 new emojis plus the UN Flag from Emoji 4.0. 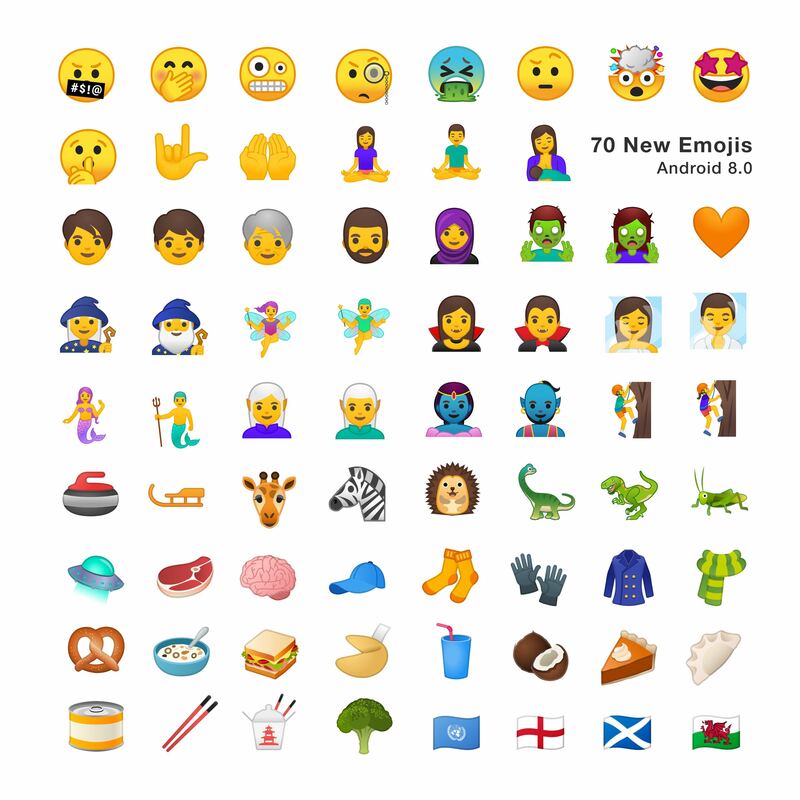 This brings the number of new emojis for Android 8.0 to 70, plus skin tones for the human emojis. Above: New emojis in Android 8.0 Oreo. Image: Emojipedia composite. 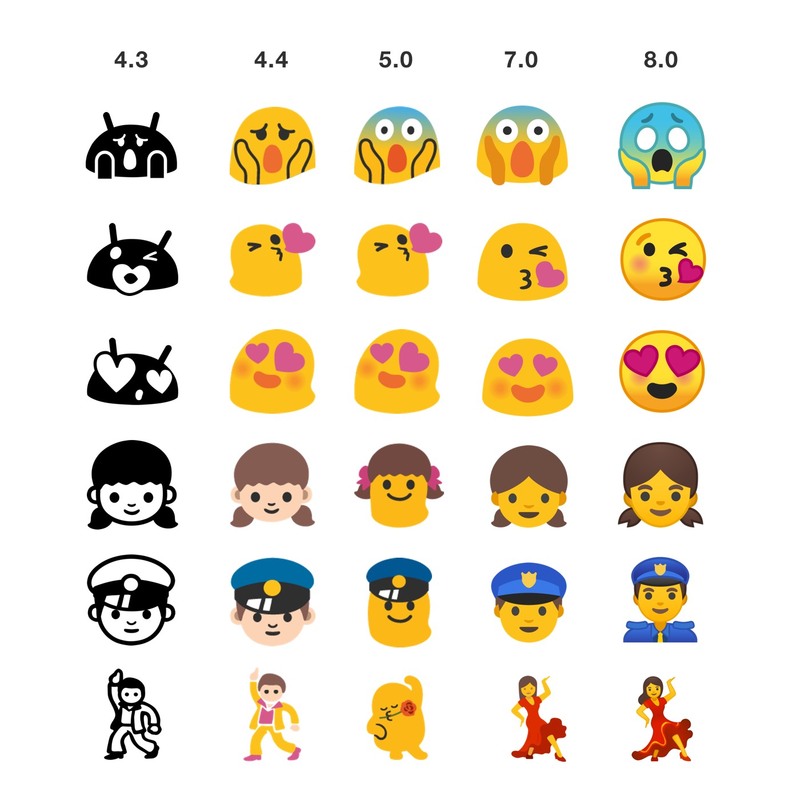 For the background of what's new in Android 8.0; the best starting place is the Emoji 5.0 list published in March 2017. This outlines every new addition approved by Unicode this year; and this latest Android release supports all of them. These include a bearded man, zombies, and a 'shhh' face. Above: Now available in Android 8.0. Lastly, the UN Flag appeared to be an oversight in last year's Android 7.1 release. This was included with Emoji 4.0; and it's now made its way to Oreo. Flags for England, Scotland and Wales are listed in Emoji 5.0 and thus also available on Android for the first time. Above: Four new flags available in Android 8.0: United Nations, England, Scotland, Wales. Everything has changed. The blobs (gumdrop-shaped characters that have been with us since 2013) have now been shown the door. Replacing the blobs are a uniform set of circular smileys. Above: Android through the ages; from version 4.3 in 2012 to 8.0 in 2017. Image: Emojipedia Composite. Looking back, this has been taking place over quite some time. Gumdrops that previously came in various shapes and sizes have slowly been morphing into a consistent shape with each release. And while these blob characters were previously used for both humans and smileys, that hasn't been the case since Android added support for skin tones in 2016. Above: Alien, blob, gumdrop, circle: these smileys have come a long way. Image: Emojipedia Composite. Some changes are more subtle than others. The humans have been given a once-over, with many gaining eyebrows and darker outlines. Most emojis now feature more detail, and a number that haven't been updated in years get completely new designs. Above: Each emoji features more detail in Android 8.0. These look great on high resolution screens. Left: Android 7.1; Right: Android 8.0. Image: Emojipedia Composite. 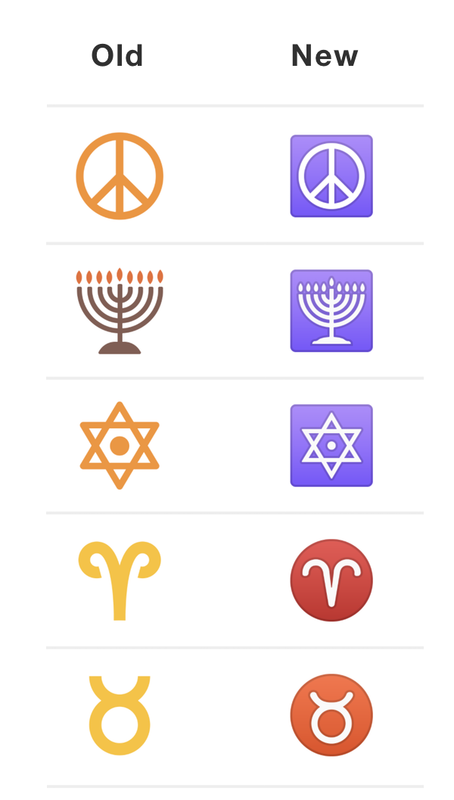 Symbols are generally closer to their iOS counterparts, as are many of the emojis in Oreo. If one of Google's goals with this update is to improve compatibility with other platforms, then they have achieved it with this release. Above: Even the symbols got an overhaul in Oreo. Left: Android 7.1; Right: Android 8.0. Image: Emojipedia Composite. As with all Android releases, availability and timing will depend on your specific device. Users of first-party Google phones such as the Pixel will be some of the first to receive this update. Users of other phones may have to wait longer, or for a new phone to get Android 8.0 Oreo. Some good news for those with phones that are unlikely to see updates: Google has released a library called EmojiCompat that allows apps to support new emojis even on old versions of Android! Above: Android 8 includes these nine new smileys. Image: Emojipedia Composite. 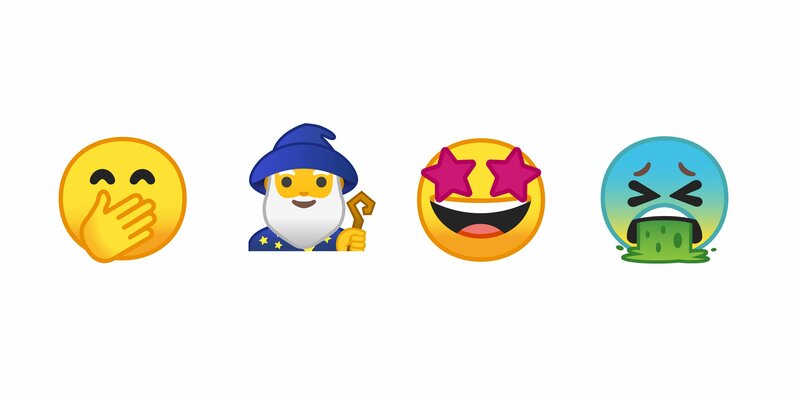 At this stage no apps yet support EmojiCompat, but if or when they do start providing support, users could start seeing these new emojis even on older Android releases. View all emojis from Android 8.0 Oreo. Just new emojis from Android 8.0 Oreo.